Im September 2013 hat mich das musikmachen.de Team eingepackt und in Düsseldorf bei der extrem musikalischen Familie Falk wieder rausgelassen. 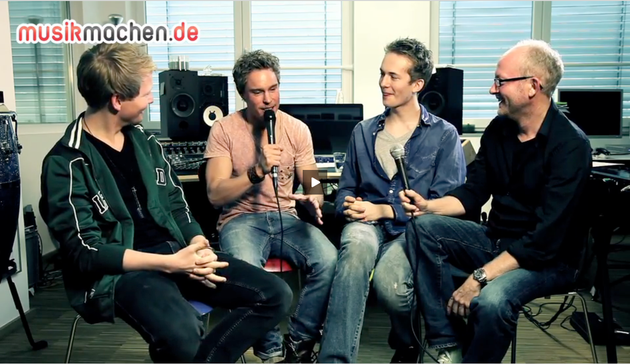 Das dort entstandene Interview, u.a. anlässlich des am 11. Oktober erschienenen Albums "Toccata", gibt es einen Klick weiter. I do trust all the ideas you have presented in your post. They are really convincing and will certainly work. Nonetheless, the posts are too quick for starters. May you please prolong them a little from next time? Thanks for the post. After looking at a handful of the blog posts on your web page, I honestly like your way of writing a blog. I saved as a favorite it to my bookmark website list and will be checking back soon. Please visit my web site too and let me know your opinion. You are so awesome! I don't suppose I've read something like this before. So good to discover someone with a few original thoughts on this topic. Seriously.. thanks for starting this up. This web site is something that is required on the web, someone with a bit of originality! hey there and thank you for your information � I've certainly picked up something new from right here. I did however expertise some technical issues using this website, since I experienced to reload the web site a lot of times previous to I could get it to load correctly. I had been wondering if your web hosting is OK? Not that I'm complaining, but sluggish loading instances times will sometimes affect your placement in google and can damage your quality score if ads and marketing with Adwords. Well I am adding this RSS to my email and can look out for much more of your respective interesting content. Ensure that you update this again soon. Hello very cool website!! Man .. Excellent .. Wonderful .. I will bookmark your blog and take the feeds also? I am glad to find numerous helpful info right here in the submit, we want work out more strategies in this regard, thank you for sharing. . . . . . Your means of explaining all in this piece of writing is genuinely pleasant, all can easily be aware of it, Thanks a lot. Asking questions are in fact good thing if you are not understanding something entirely, however this article provides good understanding yet. I really love your website.. Very nice colors & theme. Did you build this website yourself? Please reply back as I'm wanting to create my own personal website and want to know where you got this from or what the theme is named. Cheers! Its like you learn my mind! You seem to understand a lot approximately this, like you wrote the guide in it or something. I believe that you simply could do with some percent to power the message home a bit, however other than that, this is magnificent blog. An excellent read. I will definitely be back.